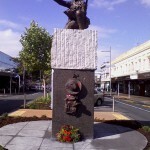 The bronze portrayal of Sapper Moore-Jones kneels on stone gifted by the Government of Turkey and the City of Çanakkale from their homeland. This artwork illustrates the collaboration between our two communities today: the soldier-artist upon the stony battle field, the landscape intersected with the artist’s drawn black line. History joins us together. For New Zealanders, Gallipoli in 1915 was disastrous yet out of this battle field arose a sense of nationhood beyond the British Empire. For the Turks, Gallipoli was also the eve of a new era beyond the Ottoman Empire, leading to the birth of the Republic in 1923. 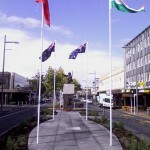 Ambassador Damla Yesm Say – The Sapper Moore-Jones statue’s wonderful combination with the Turkish granite base from Çanakkale is a moving tribute to the unique relationship between Turkey and New Zealand. It is also a concrete testimony to how our two nations forged a timeless friendship out of the horrors of war. Descendants of those who served in the Gallipoli Campaign, as well as the broader Turkish and New Zealand public have your ingenuity and dedication to thank, when they next visit this marvelous work of art…. Charge d’Affairs Aziz Sevi – The unveiling ceremony was great. The Governor and all of us enjoyed it a lot. Meeting the family of Moore-Jones was also a special moment for us. Julie Moore-Jones – On behalf of myself and my family we would like to thank you and the trust for this very special honour of remembering our Grandfather. Thank you for all the hard work and effort that was made by everyone to make this a very special occasion for us all. Cherry Barnaby – Once again well done to you. Angela Paykel – Well done to you all. Paul Snowden, who travelled from Berlin & sent the family photo – Thank you all for a lovely day! it was certainly well worth the torture of the flight down and sadly long long overdue. It was great to see you all again and learn so much about my family and how wonderful my great granddad was…it has been made very clear to me once again in a bombastic four days, what an amazing country this is and what a very special people we are. 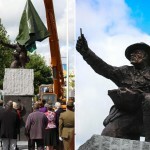 i am very proud to be a kiwi and related to this great man. I will be secretly shedding tears in the plane… And his brother Andrew Snowden – thank you for everything on Friday, what a great day it was. It really bought our family all together. 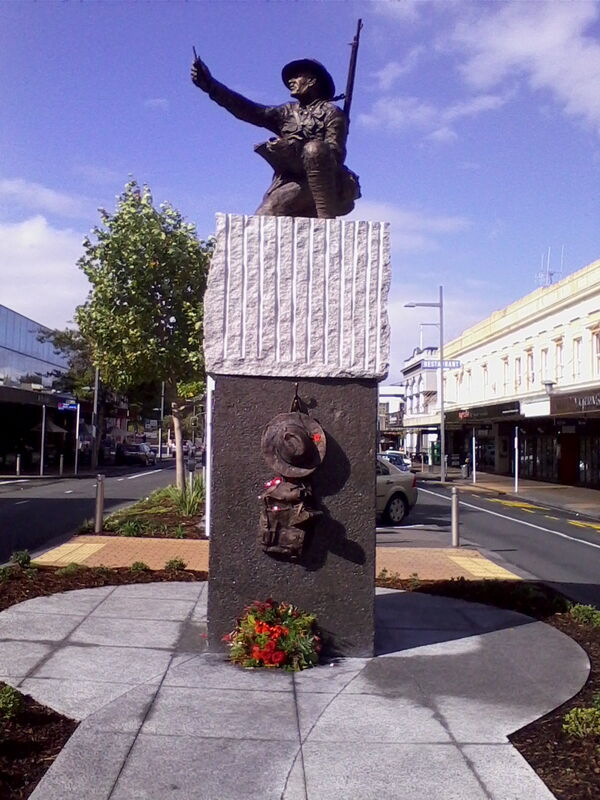 Will Scoular – Back in Auckland after having breakfast with Paul and Andrew at Scott’s and beside the memorial for Horace. Was great having to ourselves and being able to admire what a great piece of artistic work that was created. We all thought the day was fabulous and very moving and I would like to thank you for the wonderful contribution on the day and over the past few years. It was a great day and heartfelt thanks. Harry & Sharon Rowsell – We would like to pass on our sincere thanks and congratulations to you and to TOTI for your work with the Sapper Horace Moore-Jones project from start to finish; the initial ceremony of the street naming through to the unveiling on Friday last….thank you. One of the things that impressed the both of us was what the young people from Hamilton Girls and Boys High brought to the event. The girls’ choir was soft and solemn whilst the boys’ haka was full of passion and purpose that made the both of us so proud of our roots. Joyce Mullins – Thank you so much. It was a wonderful day and I felt honoured to be part of it. My mother, his niece, would have loved to have been there, I know. The day was a great credit to yourself and members of Toti and all who were involved in it. It is a particularly striking and appropriate statue of Uncle Horace who certainly was a very special man. Susan Hassall (HBHS Headmaster)– Congratulations on a wonderful event on Friday. All of the months of planning and preparation, and the dedication of your team, made the ceremony very special. You must be thrilled with the final ‘finished product’ – the statue looks stunning. Thank you for allowing Hamilton Boys to be involved in the unveiling ceremony. It was a privilege for the boys to be there. Lt Col Olly Te Ua (Our MC) – Thank you for the opportunity to be involved and the privilege to MC the event. The ongoing feedback that I have received about the total unveiling ceremony was outstanding. Great balance of speakers and interactive parts such as planting of poppies, stirring haka, beautiful singing, perfectly timed karakia and karanga with the actual unveil, and a magnificent sculpture to top it off. Colonel (Rtd) Tony Hill (Royal NZ Corps of Engineers) – It was a lovely day and very moving with the students and family there. 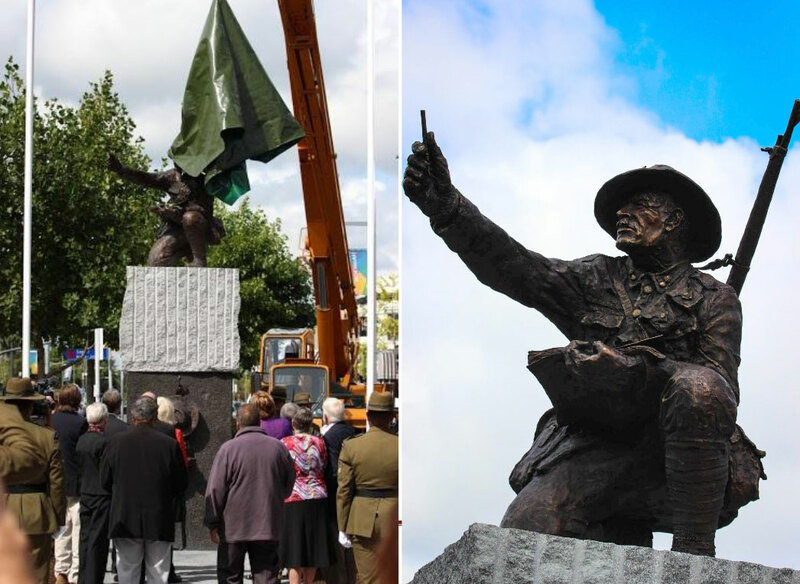 The Sappers, John Flintoft WO2 – I would like to thank you for the opportunity for 2nd Engineer Regiment, RNZE, ( Home of The Sappers) to provide support to the Spr Moore-Jones unveiling activity on Friday. It was a memorable day enjoyed by my team from Linton. Exceptionally well planned and executed with much time, effort and thought put into the activity. Mayor Julie Hardaker – Well done! A fantastic day and a wonderful addition to the city. Please pass on my sincere thanks to TOTI and all your funders. 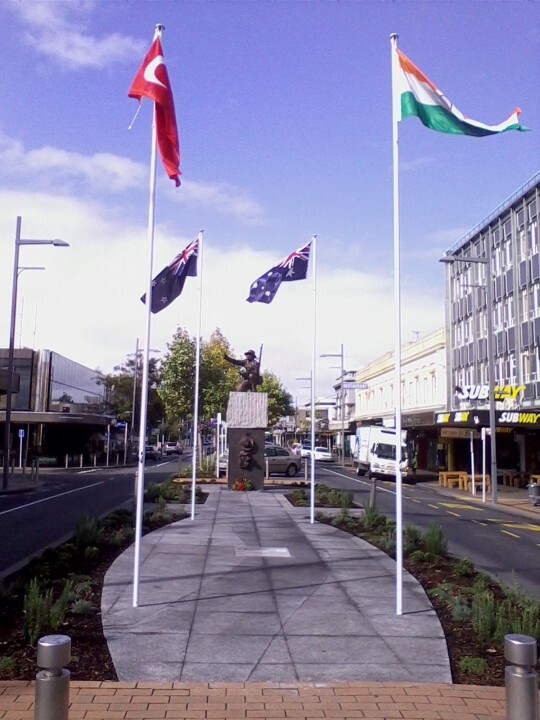 Cr Margaret Forsyth – congratulations again on a wonderfully successful project. 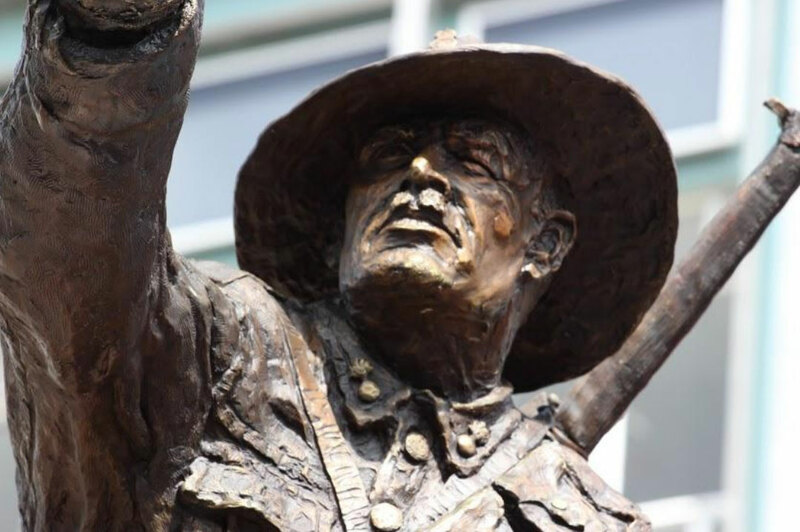 Cr Garry Mallett – I thought the unveiling was outstanding and the actual statue is going to be a Hamilton landmark forever. 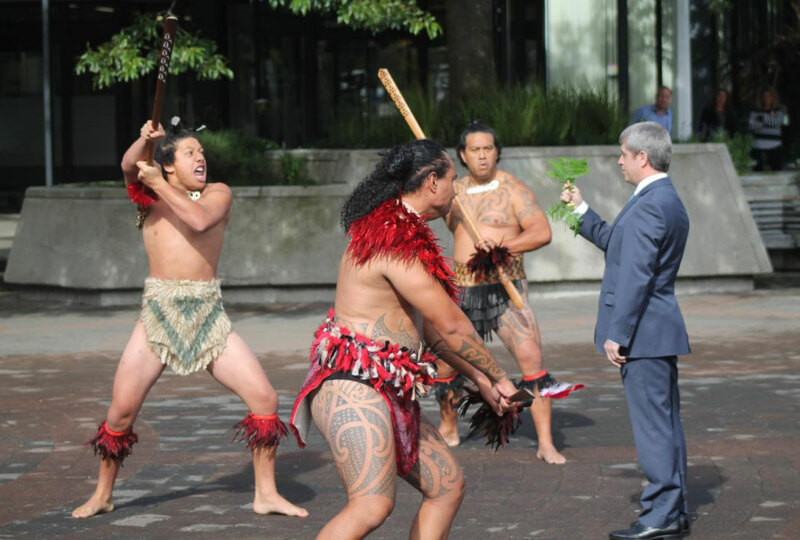 Muna Wharawhara – Congratulations on such a wonderful day. I thought the whole day was quite moving and inspirational. … that waiata from HGHS was something special and will be remembered as a real highlight of the day. Mark Caunter – Well done to the TOTI team for getting the project completed. I enjoyed the unveiling last week. The haka by the BHS was something special too. Nick Johnston – I did enjoy the launch, the ceremony turned out really well… A number of Council staff have approached me over the past few days saying they thought the artwork is fantastic. Very good feedback overall. Matt Gauldie – Thank you all for an amazing project! Jan Kruse (the computer designer) – what a wonderful day! Despite the last minute stress and all the big and small obstacles that each one of us faced on their journey towards yesterday – I feel it was a huge success and I am very proud to be part of this project! … and it was so wonderful to see all these people stopping in their cars, walking around the statue, taking photos and touching the stone. Fantastic! Neil Maternaghan – As an individual who has only recently moved to Hamilton from the U.K. I am deeply honoured and proud to have been involved in this project…Having served 14 years in the British Army this project has had a special meaning for myself. Simon Upton – A great achievement. Margaret Devlin – Well done to you on a wonderful achievement. Nicola Keen-Biggelaar – Looks like it was a fabulous day – congratulations! 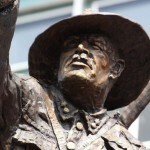 Raewyn Sporle – The statue is fantastic and a number of people have commented to me about it already!